Commentary: If Trump's Declaration Makes Portman 'Uncomfortable,' Why Is He Still Undecided? Rob Portman in June 2016. 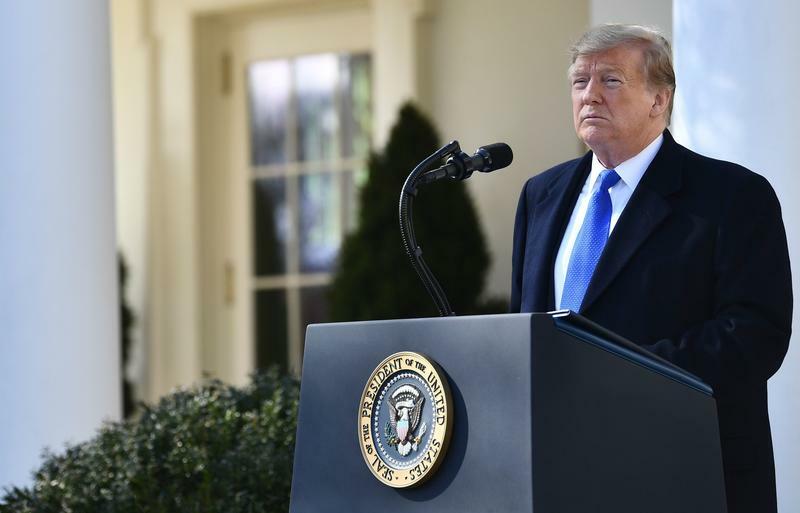 Ohio's junior senator says Trump's emergency declaration makes him "uncomfortable," but he has also repeatedly said he is undecided on how he will vote on an upcoming Senate resolution rejecting Trump's declaration. Rob Portman, Ohio's junior senator – who doesn’t have to worry about running for re-election until 2022 – is really hard to figure out sometimes. He's been, for the most part, almost slavishly obedient to President Trump. Even when he disagrees with Trump, he manages to do it without mentioning the president's name. He can't seem to bring himself to say, Mr. President, you are wrong. Portman says Trump's emergency declaration to pay for his border wall makes him "uncomfortable," but he has also repeatedly said that he is undecided on how he will vote on an upcoming Senate resolution rejecting Trump's declaration. Tuesday morning, in a conference call with Ohio reporters, Portman once again refused to say "yes" or "no" to the question of how he will vote on the resolution. "I want to help the president achieve his goal but I have been concerned from the start about establishing a precedent through national emergency funding and also by tying it up in court,'' Portman said. Portman said he believes there are ways Trump could find the money for his wall - the full $5.7 billion - without taking the money through a national emergency declaration. "I'm continuing to work on a solution here,'' Portman told Ohio reporters. Here's what Rand Paul, the junior senator from Portman's neighboring state of Kentucky, said the other day when he announced he would be one of four GOP senators voting down Trump's emergency declaration. "I would literally lose my political soul if I decided to treat President Trump different than President Obama,'' Paul wrote in an opinion piece for Fox News. Paul opposed Obama when he perceived that the Democratic president was using emergency powers to get what Congress would not give him, which Obama did a number of times. Portman, though, is different, said David Niven, a professor of American politics at the University of Cincinnati. "Portman has proven himself the master at kicking the can down the road,'' Niven said. Jerry Austin, an Ohio Democrat with decades of experience running campaigns, says he does not understand Portman's "slavish" attitude toward Trump. "But, then again, he tends to support whatever president is in power,'' Austin said. "He did it with Obama too." Portman is getting beat up on social media – especially in Ohio – for his relationship with Trump. "And it really makes no sense – he's not up for re-election to the Senate until 2022, after the next presidential election,'' Austin said. "It would be the easiest thing in the world for him to call Trump out. If you look at Portman's two Senate races, he is more popular in Ohio than Trump." Niven said the Portman-Trump relationship reminds him of a principle he was taught in college. It goes like this: Inconsistent response is the easiest way to induce irrational behavior. Niven explained it this way: There was a soda machine on campus that rarely worked, but students would routinely pump coins into the slot, hoping to get a soda. They almost never got a soda, yet they kept pumping coins into the machine. "That's sort of like Portman,'' Niven said. "Still putting coins in the Trump machine and getting nothing out of it. It's strange behavior." Senate Majority Leader Mitch McConnell says he thinks the Senate will pass a bill attempting to block President Trump's national emergency declaration over border security, but that Congress wouldn't be able to override a veto. Sen. Rand Paul says he'll vote to block President Donald Trump's national emergency declaration over border security, making him the deciding Republican vote on the issue. The parents of Otto Warmbier issued a statement Friday in response to President Donald Trump's defense of North Korean leader Kim Jong Un and the alleged treatment of their son while in North Korea's custody.